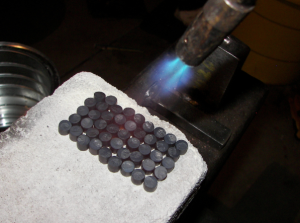 I started out on my bead making journey after deciding it would be really neat to make my own rosary out metal. At first I thought I would just go with mild steel, but eventually I decided on Copper as it is easier to form and, in general, is fun to work with (not to mention much nicer to look at). I was after a “manly” rosary – something with some weight, strength and size (8mm, to me, has the best feel to it in my hands, so that’s the size that I work with). I thought that I would share with others how I make my copper beads so that 1) people can understand how much work goes into them and 2) so that anyone with the notion to take on a project like this themselves would have a starting point. A shearing device (while you can use a hack-saw, this method takes a lot more time and also wastes material). 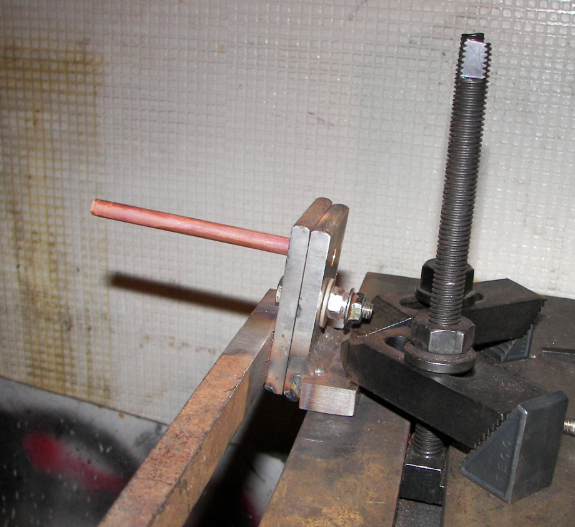 My shearing device is made from hardened tool steel (leaf springs from a truck) and a hardened pivot bolt. This is not the only possible design by any means, but it’s what I was able to put together based on what I had in my shop. A ball end-mill to make your top and bottom die. Ball end mills can be ordered off the internet and are relatively inexpensive. 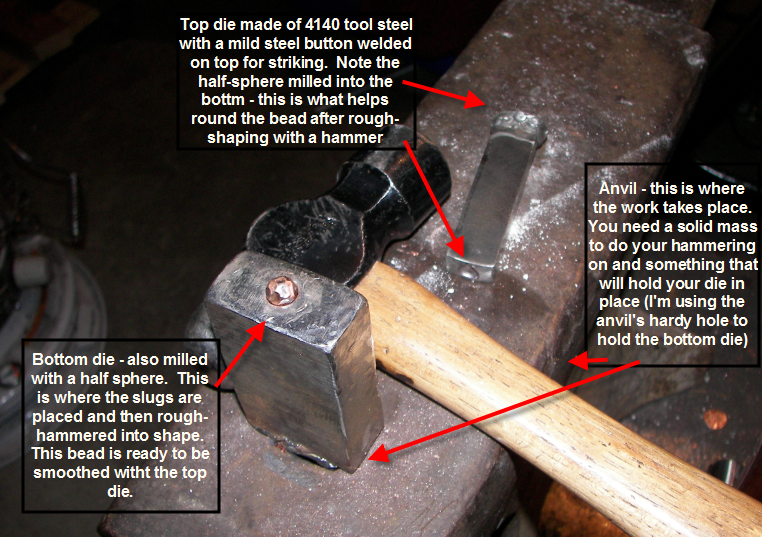 Be prepared to work with your dies, though – you can’t just mill a half surface. 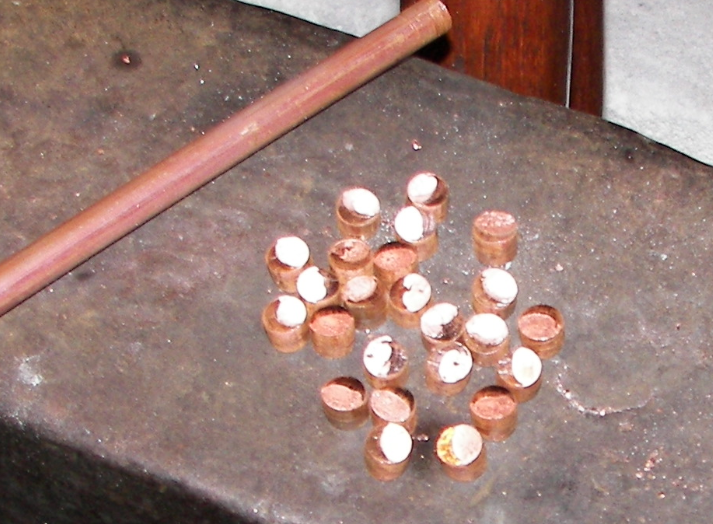 You need to bevel the edges or you’ll constantly stick your slugs inside the dies when you go to hammer them. A welder (or a friend who has one) for making your shear, your hardy tool, etc. 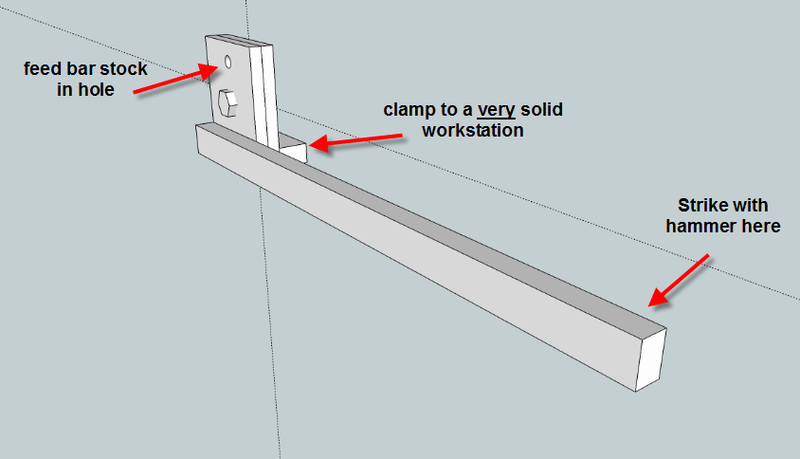 The first step in the process is making the shearing device. 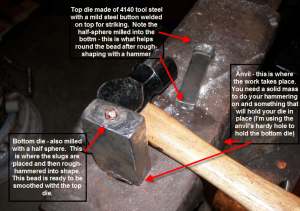 To make one of these, you will need some good tool steel plates and hardened nuts and bolts, a steel bar, a bit of welding skills and a really good place to mount it when you’re all done (a blacksmith’s post vise works well for holding these types of tools). 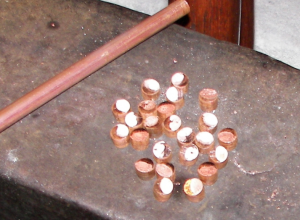 Now that you have your slugs, you’ll need to anneal them. They are too hard to hammer at this point and need to be softened. 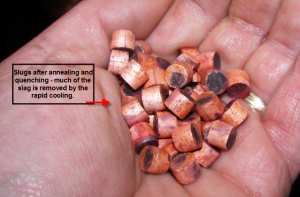 To do this, heat them on a fire brick to a dull-red heat (this step is best done in the dark). Once cleaned, you’re ready for the anvil. Put your slug in the bottom die and start hammering, rotating the slug as you slowly transform it into a sphere.Once you have it into a rough round shape, you start using the top die to make the final product or you can go on to texture it, apply a brushed finish with a grinder, etc. Get creative – that’s where the fun comes in! Next, you need to drill your hole. 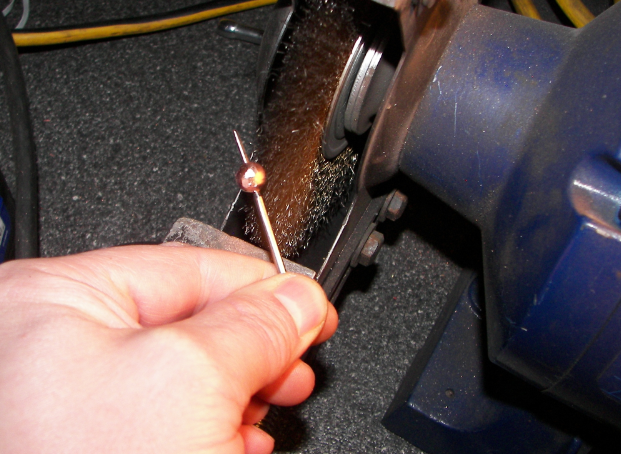 I use a dedicated drill press that is pre-set up and centered for 8mm beads.When drilling copper, you want a fast speed and lots of lubricant. Don’t try to rush your way through the bead or you WILL break your drill bit. 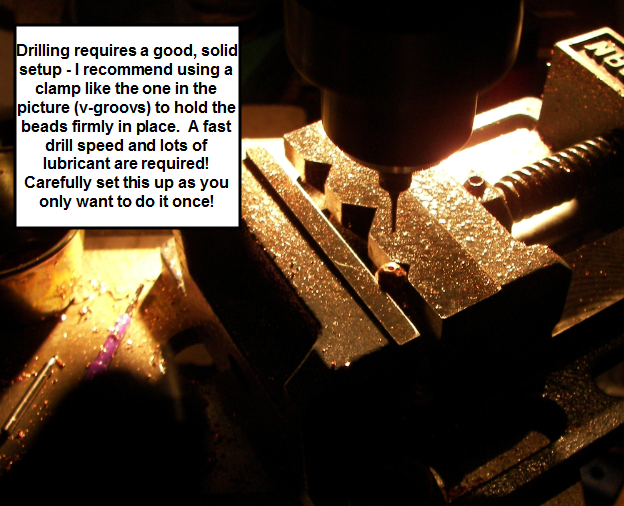 Instead of a constant, steady drilling pressure, you want to slowly ‘peck’ your way through the bead. Apply pressure and drill about 1/16″ into the bead, apply lubricant, drill another 1/16″, apply more lubricant and repeat until you punch your way through the other side. Thanks so much this geart instructions. I would love 2 have access to a shop to do meatal smything in. Sorry – I sure don’t. That’s pretty small – you might have a tough time finding something like that. I know it would be very difficult to make using the method I use. How much would you sell those beads for? Or a copper rosary? Thanks for asking. Due to the time commitment, I no longer sell them or make them.